A group of Japanese doctors has conducted periodic blood tests in 100 individuals to investigate the antioxidant activity of preB on human bodies. Antioxidant activities are actions that remove active oxygen which is said to be a cause of life-style related diseases and aging. Scientific analysis have confirmed that it has a high level of antioxidant activity, and we have been investigating to what degree it exerts the antioxidant activity on human bodies. Dr.Kageyama is a doctor who does not rely on western medicine alone, but performs diagnoses and treatments while recognizing all kinds of factors including physical constitution, temperament, environment, lifestyle, eating habit,etc. 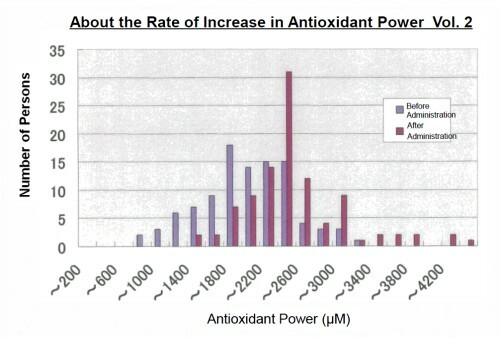 Antioxidant power shifted to the right, showing distinct increases in the value. The fluctuation in the antioxidant power reflects the increase and decrease in the comprehensive immune power of living bodies. 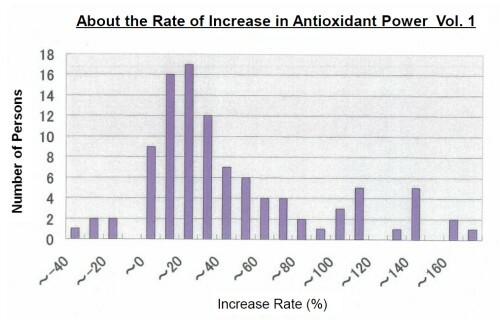 In this clinical trial, the average increase rate for antioxidant power is as high as 38%, showing that this supplement has an significant antioxidant effect. The results also showed that this supplement comprehensively leads to immune activation. It was suggested that particularly when there were disorder of lifestyle and increase inoxidative stress during the clinical trial period, antioxidant power may have increased by secure exertion of the effect of this supplement.